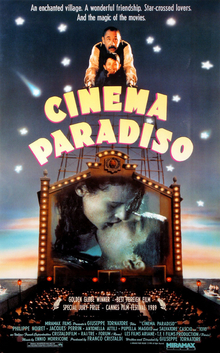 Cinema Paradiso (Italian: Nuovo Cinema Paradiso, Italian pronunciation: [ˈnwɔːvo ˈtʃiːnema paraˈdiːzo], "New Paradise Cinema") is a 1988 Italian drama film written and directed by Giuseppe Tornatore. The film stars Jacques Perrin, Philippe Noiret, Leopoldo Trieste, Marco Leonardi, Agnese Nano and Salvatore Cascio, and was produced by Franco Cristaldi and Giovanna Romagnoli, while the music score was composed by Ennio Morricone along with his son, Andrea. It won the Academy Award for Best Foreign Language Film at the 62nd Academy Awards. Cinema Paradiso was shot in director Tornatore's hometown Bagheria, Sicily, as well as Cefalù on the Tyrrhenian Sea. The famous town square is Piazza Umberto I in the village of Palazzo Adriano, about 30 miles to the south of Palermo. The ‘Paradiso’ cinema was built here, at Via Nino Bixio, overlooking the octagonal Baroque fountain, which dates from 1608. Told largely in flashback of a successful film director Salvatore to his childhood years, it also tells the story of the return to his native Sicilian village for the funeral of his old friend Alfredo, the projectionist at the local "Cinema Paradiso". Ultimately, Alfredo serves as a wise father figure to his young friend who only wishes to see him succeed, even if it means breaking his heart in the process. Seen as an example of "nostalgic postmodernism", the film intertwines sentimentality with comedy, and nostalgia with pragmaticism. It explores issues of youth, coming of age, and reflections (in adulthood) about the past. The imagery in the scenes can be said to reflect Salvatore's idealised memories of his childhood. Cinema Paradiso is also a celebration of films; as a projectionist, young Salvatore (a.k.a. Totò) develops a passion for films that shapes his life path in adulthood. The film exists in multiple versions. It was originally released in Italy at 155 minutes, but poor box office performance in its native country led to its being shortened to 123 minutes for international release; it was an instant success. This international version won the Special Jury Prize at the 1989 Cannes Film Festival and the 1989 Best Foreign Language Film Oscar. In 2002, the director's cut 173-minute version was released (known in the U.S. as Cinema Paradiso: The New Version). A special edition of Cinema Paradiso was released on DVD by Umbrella Entertainment in September 2006. The DVD is compatible with all region codes and includes special features such as the theatrical trailer, the Director's Cut version, scenes from the Director's Cut, the Ennio Morricone soundtrack and a documentary on Giuseppe Tornatore. An Academy Award edition of Cinema Paradiso was released on DVD by Umbrella Entertainment in February 2009. It is also compatible with all region codes and includes different special features such as Umbrella Entertainment trailers, cast and crew biographies and the Director's filmography. In July 2011 Umbrella Entertainment released the film on Blu-ray. Arrow released a remastered special edition Blu-ray of the film, with both theatrical and extended cuts, in 2017. Cinema Paradiso was a critical and box-office success and is regarded by many as a classic. It is particularly renowned for the 'kissing scenes' montage at the film's end. Winning the Academy Award for Best Foreign Film in 1989, the film is often credited with reviving Italy's film industry, which later produced Mediterraneo and Life Is Beautiful. Film critic Roger Ebert gave it three and a half stars out of four and four stars out of four for the extended version, declaring "Still, I'm happy to have seen it--not as an alternate version, but as the ultimate exercise in viewing deleted scenes." Review aggregator Rotten Tomatoes reports that 90% of critics have given the film a positive review based on 70 reviews, with an average score of 8/10. The film also holds a score of 80 based on 20 reviews on Metacritic. The film was ranked #27 in Empire magazine's "The 100 Best Films Of World Cinema" in 2010. The famed "kissing scene" montage at the end of the film was used in "Stealing First Base", an episode of The Simpsons that aired on March 21, 2010, during its twenty-first season. The scene used Morricone's "Love Theme" and included animated clips of famous movie kisses, including scenes used in Cinema Paradiso as well as contemporary films not shown in the original film. American progressive metal band Dream Theater 1992 album Images and Words's song Take The Time features in the lyrics the sentence spoken by Alfredo after the fire ora che ho perso la vista, ci vedo di più! (I can see much clearer now I'm blind). ^ Vancheri, Barabara (26 March 1990). "Foreign-movie nominees discuss money, muses". Pittsburgh Post-Gazette. p. 10. Retrieved 7 July 2012. ^ "Cinema Paradiso (1990) - Box Office Mojo". ^ "The 62nd Academy Awards (1990) Nominees and Winners". oscars.org. Retrieved 6 September 2015. ^ Porter, Darwin; Danforth Prince (2009). Frommer's Sicily. Frommer's. p. 132. ISBN 0-470-39899-X. ^ "Cinema Paradiso film locations (1988)". The Worldwide Guide to Movie Locations. ^ "Festival de Cannes: Cinema Paradiso". festival-cannes.com. Retrieved 1 August 2009. ^ "Umbrella Entertainment - Special Edition DVD". Archived from the original on 28 August 2011. Retrieved 28 May 2013. ^ "Umbrella Entertainment - Academy Award DVD". Retrieved 28 May 2013. ^ "Umbrella Entertainment - Blu-ray". Retrieved 28 May 2013. ^ Ebert, Roger (16 March 1990). "Cinema Paradiso Movie Review & Film Summary". Chicago Sun-Times. Retrieved 9 August 2018 – via Rogerebert.com. ^ Ebert, Roger (28 June 2002). "Cinema Paradiso: The New Version Movie Review". Chicago Sun-Times. Retrieved 8 August 2015. ^ "Cinema Paradiso (Nuovo Cinema Paradiso) (1988)". Rotten Tomatoes. Retrieved 22 February 2018. ^ "Cinema Paradiso Movie Reviews, Ratings, Credits, and More". Metacritic. Retrieved 26 January 2011. ^ "The 100 Best Films Of World Cinema: 27. Cinema Paradiso". Empire. Bondanella, Peter E. (1 January 2001). Italian Cinema: From Neorealism to the Present. Continuum International Publishing. ISBN 978-0826412478. Marcus, Millicent Joy (24 April 2002). After Fellini: National Cinema in the Postmodern Age. JHU Press. ISBN 978-0801868474. This page is based on the Wikipedia article Cinema Paradiso; it is used under the Creative Commons Attribution-ShareAlike 3.0 Unported License (CC-BY-SA). You may redistribute it, verbatim or modified, providing that you comply with the terms of the CC-BY-SA.